Adblock tools have been playing an important part in blocking the annoying and repetitive advertisements for a long time. The flip side is that, there are times when these advertisements may bring some lucrative deals, which you may not get offline. To see such advertisements, these Adblocks are the first barrier. The adblock tools on your browser doesn’t let any advertisements appear, which results in losing the good deals. 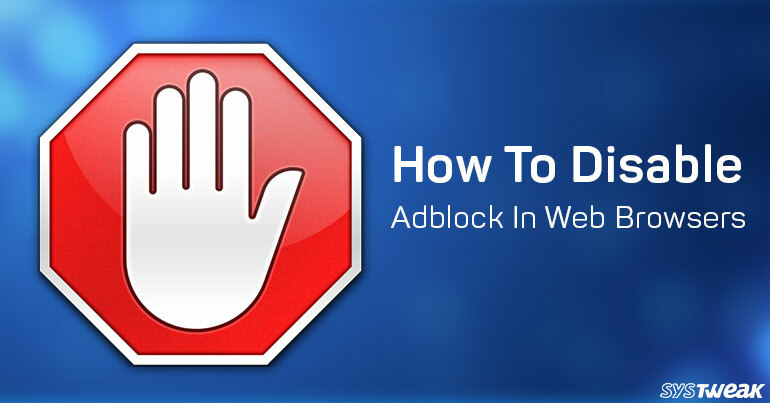 It means, you need to disable adblock in your Chrome or any web browser you’re using. Launch Google Chrome browser on your machine. Click on the three vertical dots (Options) button in the right-hand side top corner. Drag the mouse pointer over ‘More Tools’ in the list of options. Select Extensions from the side menu of More Tools. Find the Adblock extension in the list and click on either the checkbox to disable it or hit the bin button to remove it completely from the browser. Exit and relaunch the browser to make the changes applied. Launch Mozilla Firefox on your system. Click on the menu button (three horizontal stripes together) in the right-hand side top corner. Find your Adblock and hit the cog icon. Select your action whether you wish to turn on or off the adblock. Click on the Safari icon on your Mac or Windows machine. Click on Safari beside the apple icon and select Preferences from the list of options. Uncheck the Enabled checkbox to disable it. Open the Microsoft Edge on your computer. Hit the More… and choose Extensions. Click the Setting icon (cog) of the Adblock. Make your selection by either turning on or off. Launch the Opera web browser on your PC/laptop. Go to the Menu button. Select Extension from the list of options. Find the Adblock from the list of Extensions available. Close and relaunch the Opera web browser to apply the changes. Now that you know how to disable Adblock on Chrome and other popular web browsers, you can make changes on your own. Though Adblock is the best way to avoid irritating advertisements, it indirectly refrains you of some good deals. If you get your work done after uninstalling or disabling the Adblock, you may turn it back on to keep yourself away from the big screened advertisements.